WHEN IM UNLOADING THE DISHWASHER FOR THE 5TH TIME THIS WEEK - ProudMummy.com the Web's Community for Mums. 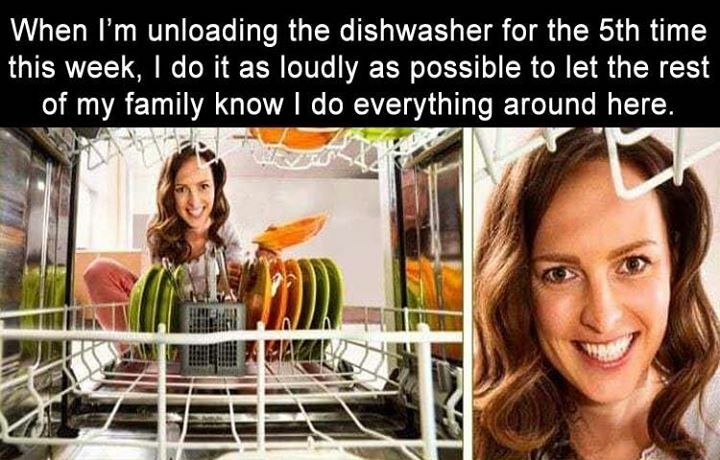 WHEN I'M UNLOADING THE DISHWASHER FOR THE 5TH TIME THIS WEEK, I DO IT AS LOUDLY AS POSSIBLE TO LET THE REST OF MY FAMILY KNOW I DO EVERYTHING AROUND HERE. But they cant hear because they all.have headphones on!